Sunday being a day of rest, we took the opportunity to avoid the rain and indulge in activities exclusively for women. 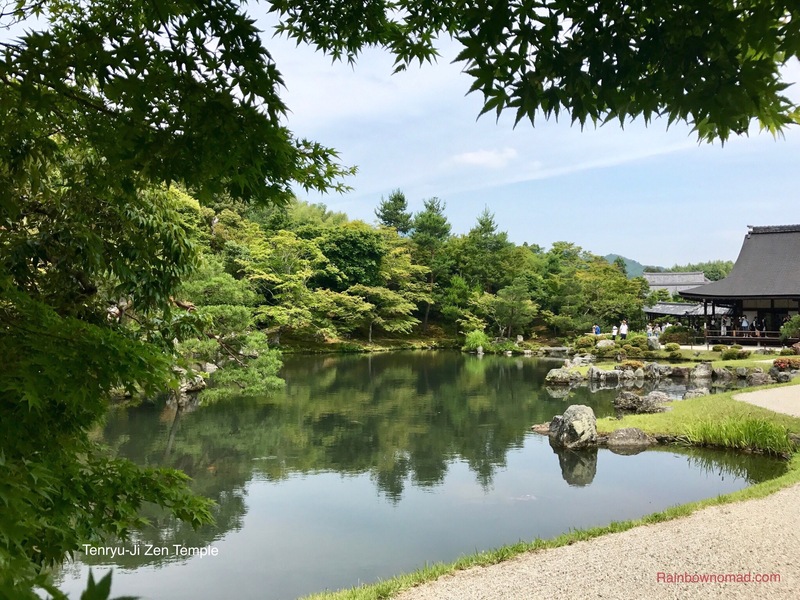 Taking the number 5 bus from Kyoto Station on a leisurely meander through the suburbs, we arrived at the Kyoto University of Art and Design in time for the Kyoto five Kagai joint performance of geiko and their trainee maiko. 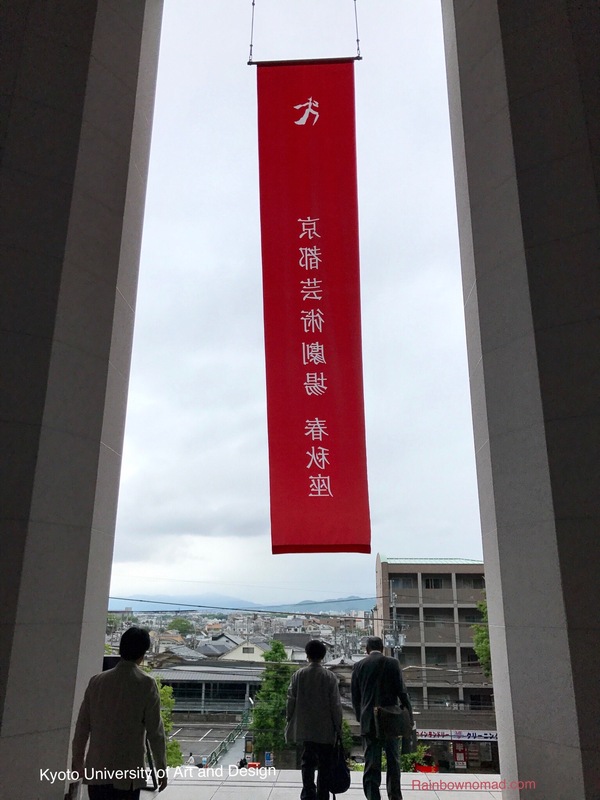 Entering into the Shunju-za or concert hall, we felt significantly underdressed and were the only Westerners. However as we were only 3 rows from the stage, we had a fabulous view but photos were strictly forbidden. 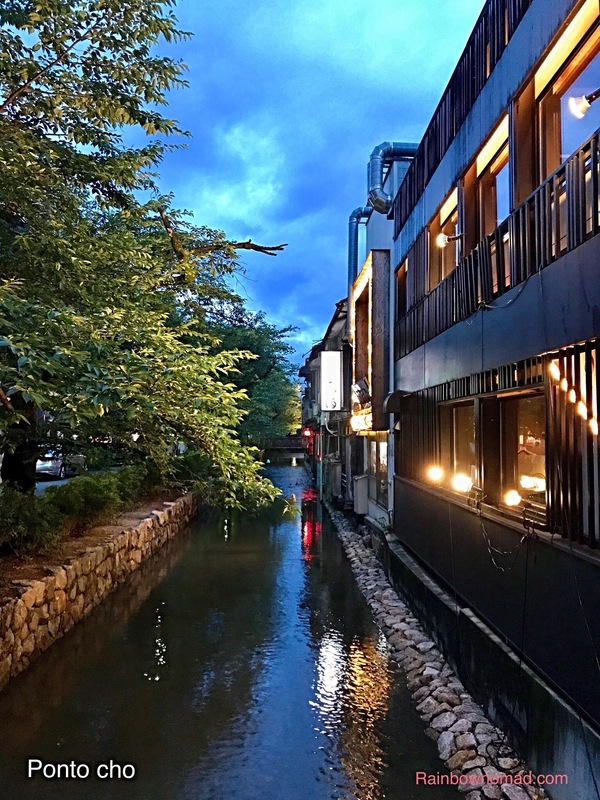 Kyoto is known as geisha central and according to our Lonely Planet guide, there are 65 geiko and 185 maiko centred around the five Gion districts in Kyoto – Gion Kobu, Miyagowacho, Gion Higashi, Kamashichiken and Pontocho. 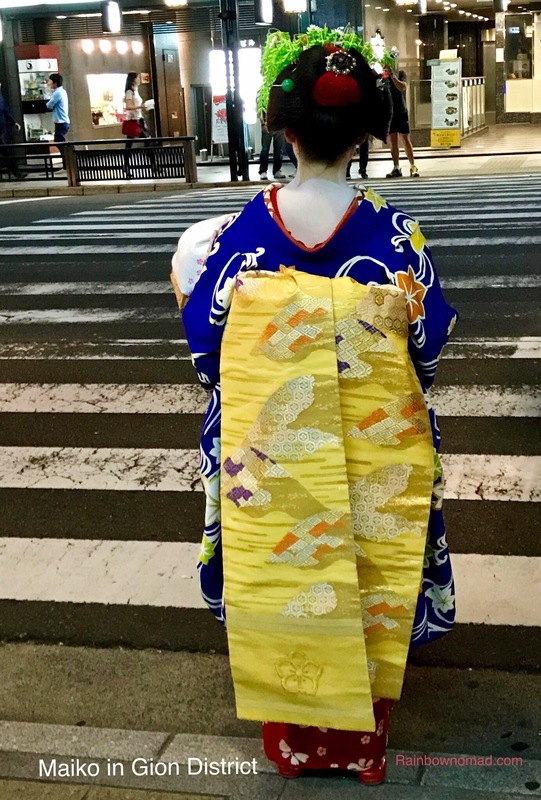 We had wandered these streets earlier and stumbled on two different maiko, exiting their residence and discreetly running to their next assignation. We realised later they were truly maiko, as they both carried a small basket with the props for their ‘show’. A maiko is a girl aged between 15 and 20, who agrees to a five year training period in a okiya or training house, where she learns traditional Japanese arts, including dancing, singing, tea ceremony and the shamisen, a three stringed instrument. During this time, she will begin to entertain guests, under the tutelage of a geiko. Once she has finished her training, a maiko now geiko can move out of the okiya and live on her own, have boyfriends but not marry – and pay back the considerable investment in her training, including the beautiful kimonos, obi or sash and decorative ornaments. Apparently it is easy to spot the difference between a maiko and geiko, as maiko wear their own hair elaborately decorated with combs and ornaments, red sandals and distinctive white makeup especially on their neck area. Geiko wear black wigs, as shiny as lacquer elaborately styled but only with a comb and the traditional platform sandals with two bridges. Our performance included dances from the five districts by geiko, accompanied by the choir and orchestra of geiko – right in front of us – of varying ages and dressed simply in black. The kimonos worn by the dancers were exquisite and the dance often involved the top kimono being folded down to reveal another kimono underneath. It was like watching a pageant unfold. Finally, about 40 maiko came onto the stage for a final performance before each geiko was presented and bowed. It was a truly a magical experience. 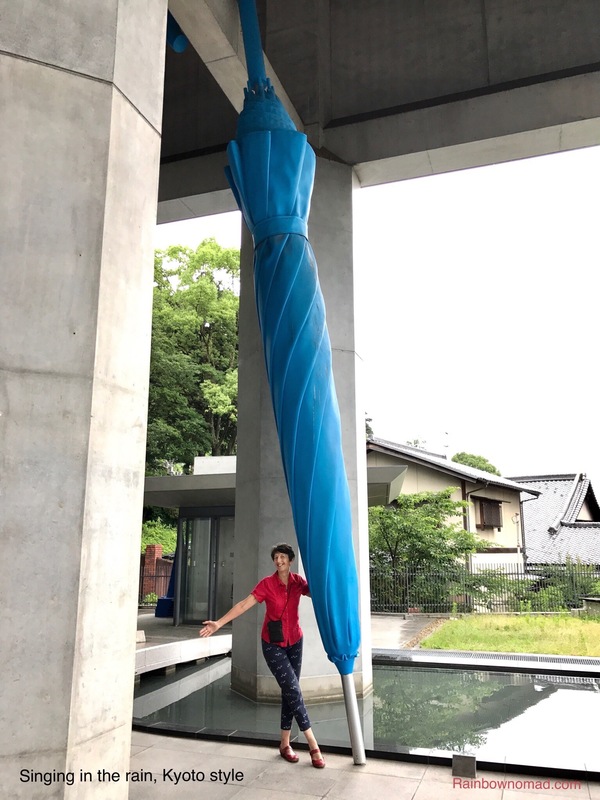 As we were leaving and waiting for the bus, we saw more maiko arriving for the afternoon performance, fluttering around the foyer, trying to avoid audience cameras. It reminded me of Australian Youth Choir performances of old, where excited young performers greeted each other, while proud parents hovered in the background. This wonderful indulgence was capped off by my treat in the Fufu Nu Yo Onsen in Arashiyama. 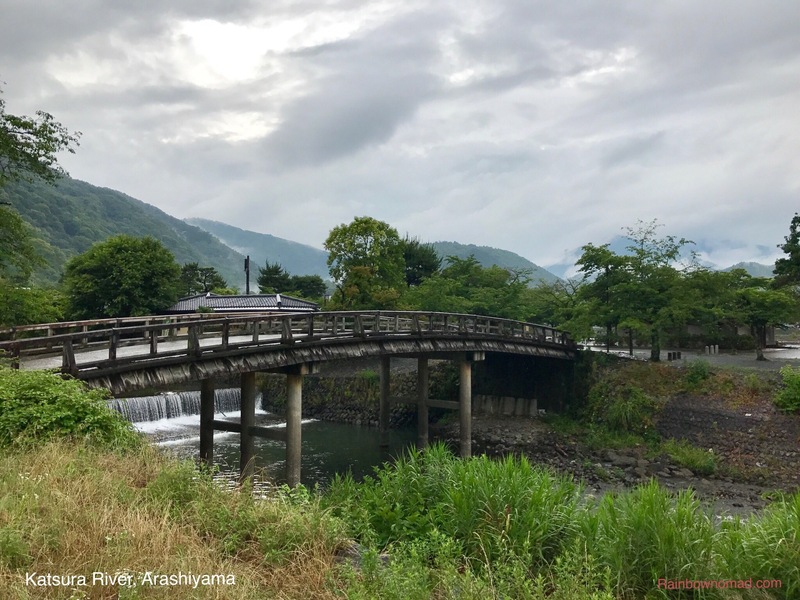 It took an hour by bus to travel to the mountains at Arashiyama which form one side of the basin in which Kyoto sits. 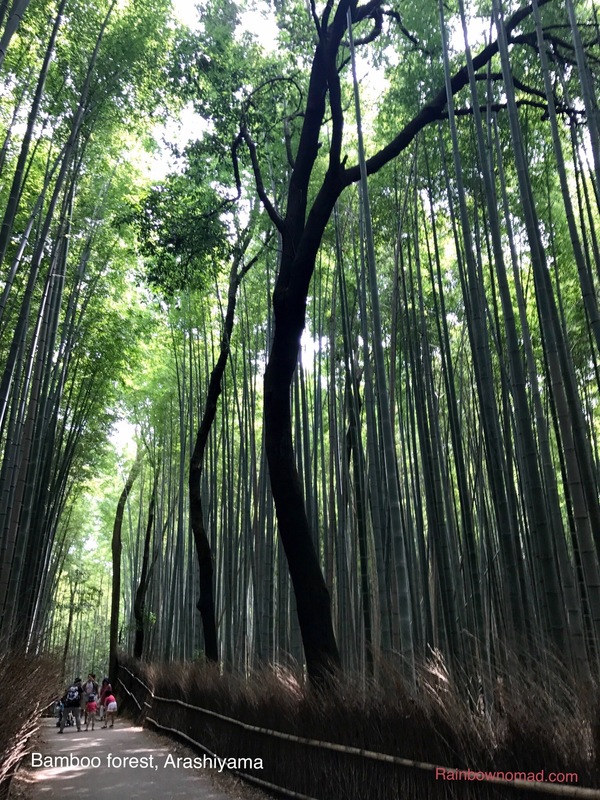 Arashiyama is famous for its bamboo grove, the Tenryu-Ji Zen Buddhist temple and surrounding garden, its monkey park and its hot springs from the Katsura river. I am not a stranger to hot springs but every one has a different procedure. They are segregated by gender and it helps if you go with a female friend as you can laugh together at the faux pas you make. It was not to be this time. Ms Tech Savvy left me at the door and a gentleman welcomed me in. We did a lot of bowing until I realised I still had my shoes on! Faux pas no.1! Shoes were promptly deposited in a locker and the key given to an attendant. Mr Helpful then directed me to a vending machine where I purchased my entry ticket and a towel. Back at the counter, the female attendant presented me with my towel and a wristband with a numbered locker key. So far so good! Into the change room I go with a limited instruction sheet. Running around naked is not something we Anglo Saxons normally do, especially when you are not sure what to do. I knew I needed to wash before entering the heated pools and miming where I needed to do that to the fully clothed attendant, wiping down the basins, resulted in me going into the wrong shower! Within a flash she politely dragged me out and pointed me in the right direction. Finally I lowered myself into the deliciously warm and milky water, brimming with healing salts. 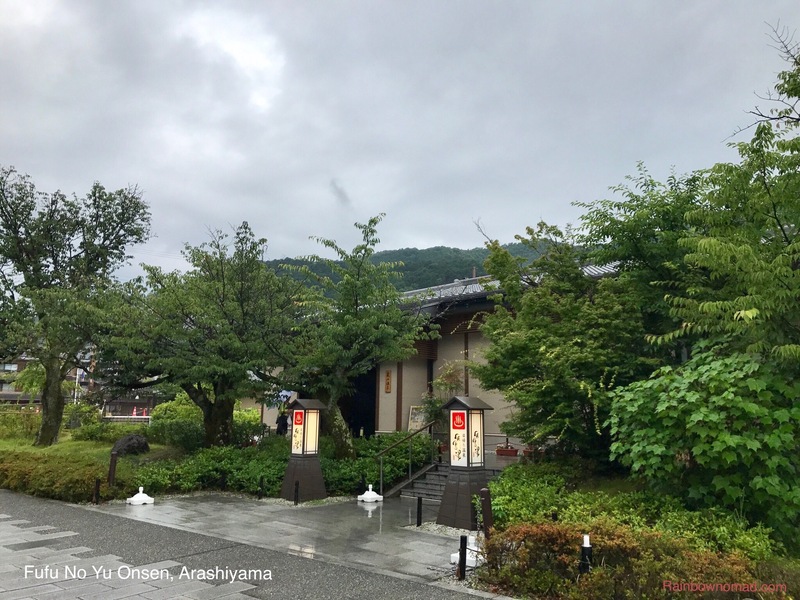 Although I again was the only Westerner, it was a wonderful experience watching the rain softly falling outside and listening to the murmured chatter and laughter of my onsen companions. 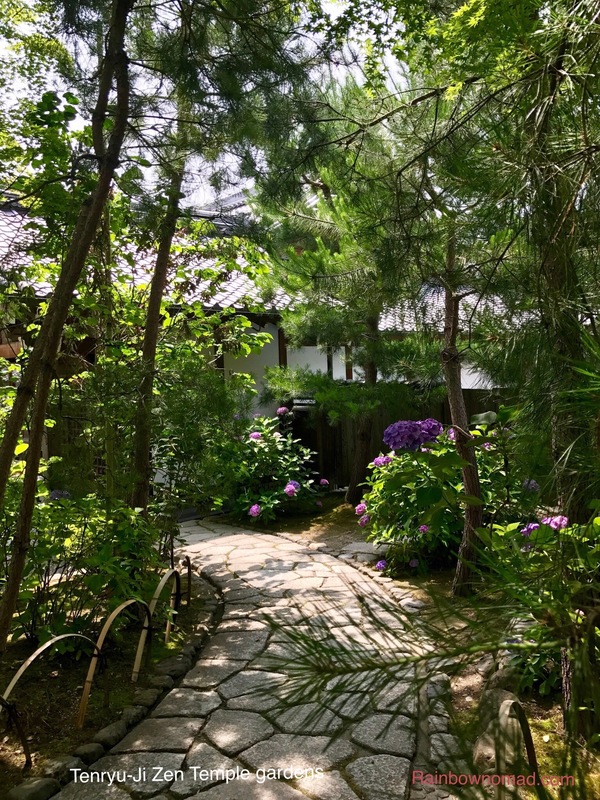 I truly felt like a woman in Kyoto.